Augmented reality (AR) has its origin in the virtual reality (VR), in an attempt to simulate reality and create other realities through the illusion of the senses. According to Braga  the AR is a hybrid interface composed by real overlapped by digital entities. The views can happen for various types of devices, such as monitors, projections or special glasses.Currently the RA is already being used to assist in learning processes and technical maintenance of electromechanical equipment. Can be used in sports, education, professionally and as entertainment. Because of its many applications, augmented reality (AR) contributes to the exponential increase in the amount of information. The AR requires overlapping interfaces to the real environment, through markers, taking the user to an immersion in smaller or larger scale. Santaella  covers the degrees of immersion that an interface can cause through virtual reality provided by caves, helmets, glasses or contact lenses can completely change the perception of reality. In RA you can interact with an object – an audiovisual demonstration of something – which is actually an illusion "bought" by our brain of an entity which can not really touch. The interface mediates the interaction between the user and the computer. In the case of AR this interface is not on the computer screen, but designed, projected and attached to reality. Johnson  says that there is no separation between the worlds of culture and technology. There is no novelty in "collision" of these worlds as noted and as evident today. The difference is that before this merger has already happened at a slower speed, because the ownership of the technology and its use by artists took more time to become something common. The relations of men with the machines have changed, not only in their use, but in how they were imagined.We left the era of machine-as-prosthesis and went to another where the machines are as a space (or ciberespace) to be explored. Johnson also suggests "that the digital revolution will undoubtedly transform the stock exchanges, research in libraries and credit profiles", anyway, all our experience of the world. 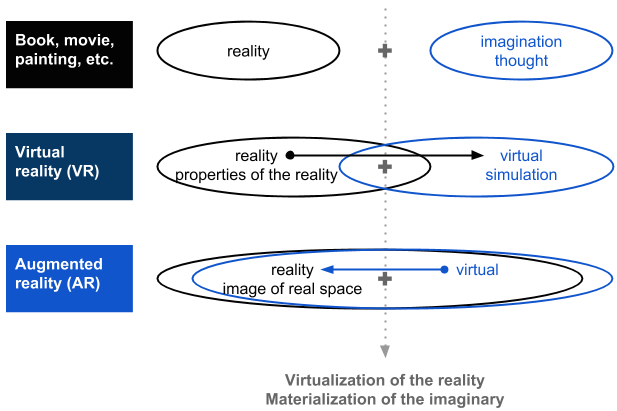 Figure: Scheme of hybridity steps between the real and the virtual environment. Wesch  proposes that "when the media change, human relations change". The AR will occupy all facets such as work, entertainment, love, family, politics, culture, art, etc. This will be through a continuous production in the area between the medium and the message: the interface. However, before there were overlapping reality interfaces, there are already cases of people isolated behind the screens (laptops, tablets or smartphones). The Second Life experience, in the early 21st century, showed edges of human relationships in contemporary times, leaving clearer how the physical interaction was exchanged for virtual interaction. This virtual interaction type is a warning sign to the growth in the number of isolated people. It is necessary to make a distinction between a virtual interaction – where the user is present through his avatar and/or image on a social media or an event without being present with his physical body – of a face-to-face interaction, where the person is physically present. The AR (as well as the frenetic use of smartphones) can hinder face-to-face involvement, because the fact of the person being there in the flesh not meaning that your attention and your sense of reality are synchronous with the space in which it is located. Corroborating, Scruton  states that "this process not only alienates people from each other, it enables people to retain control over their sensations, and so shut out the world of chance, risk, and change". On the other hand, there are people who use virtual interaction as a way of meeting people and visiting places, which would not otherwise in this way. There's even therapeutic uses of interfaces for people who have difficulties of interaction. The technologies stand to human as neutral, its use is that can positively or negatively. In the process of appropriation of the technology, the artists produce speeches and subversions of use. That's what happened with the videos used as language of artistic expression. They became so common that the 29th São Paulo Biennial of Art had so many works in video that a person would take about a month to watch all. In the case of augmented reality will be equal. For example, in the Casa Batlló in Barcelona, visitors use tablets to see through the screens animations of inanimate objects in the house,such as the fireplace becomes a mushroom that dissolves and the lamps that give off the ceiling and become turtles swimming in the air. Another example is the game for smartphones Pokemon Go. In this game the characters of the cartoon appear in front of the player to be "captured" as if they were present in the environment. The game maps cities, allocates "gyms", poke stops to receive game items and Pokemon to catch. In addition, some productions rehearse playing a vision of what could be the future through the use of augmented reality. There is also an example of a hyper reality through video simulation of human vision using a device of AR in real time. Art makes the coupling between the real and the virtual, between the concrete and the perceived, between the material and the idea – proposing new interpretations and new truths. In the vast universe of AR, with infinite possibilities, the art has never been so connected with the production of a wide synaesthetic experience, that is, being able to impress the perception and orientation systems. Not to mention that can change in time and space – providing a four-dimensional experience. However, if the AR is increasingly present the fact of not using it will be an act of anarchy or alienation? Despite the enthusiasm, which is the need to use the AR? Does isolation chambers will become popular in the future? Anyway, as concluded Chatfield , yet it is still us, in all of our humanity, entering these new spaces and having these experiences and we need to understand a future in which technology will ever more intimately mediate and define what it means to be human. BRAGA, Marta Goulart. Diretrizes para o design de mídias em realidade aumentada: situar a aprendizagem colaborativa online. Tese (doutorado) - Universidade Federal de Santa Catarina, Centro Tecnológico. Programa de Pós-Graduação em Engenharia e Gestão do Conhecimento. Florianópolis: UFSC, 2012. SANTAELLA, Lucia. Navegar no ciberespaço: o perfil cognitivo do leitor imersivo. São Paulo: Paulus, 2004. WESCH, Michael. An anthropological introduction to YouTube. Disponível em: <http://www.youtube.com/user/mwesch> Acesso em: 18 set. 2016. Scruton, Roger. Hiding Behind the Screen. The New Atlantis, Number 28, Summer 2010, pp. 48-60. Disponível em: < http://www.thenewatlantis.com/publications/hiding-behind-the-screen> Acesso em: 19 set. 2016. SOGABE, Milton. Materialização e virtualização nas mídias. In: 19º Encontro da Associação Nacional de Pesquisadores em Artes Plásticas “Entre Territórios”. Cachoeira: Anpap, 2010. Disponível em: <http://www.anpap.org.br/anais/2010/pdf/cpa/milton_terumitsu_sogabe.pdf> Acesso em: 19 set. 2016. CHATFIELD, Tom. How to thrive in the digital age. Rio de Janeiro: Objetiva, 2012. Ildo Francisco Golfetto - Doctoral student of Postgraduate Studies Program in Engineering and Management of the Knowledge, UFSC, Brazil. Maria José Baldessar - Professor of Postgraduate Studies Program in Engineering and Management of the Knowledge, UFSC, Brazil.